This past month, as my fifth graders were learning tim-ka, or dotted eighth/sixteenth, I started going through my resources to see how I might best practice this rhythm with them. It's been many years since I've taught this concept--as I've not had students long enough to get to the rhythm--so I was excited to see what I could find in my resources! I found this resource which I admit I've heard great things about but just haven't used very much! Click on the picture to see the book at West Music. 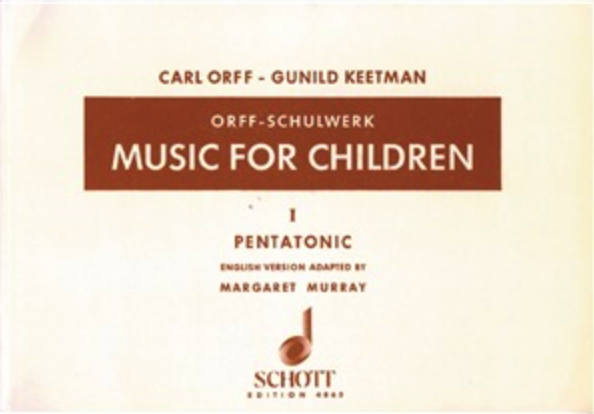 If you are an Orff-trained teacher, you likely have a well-worn version on your bookshelf. Although I've had some Orff experiences, I do not have training....but I know that good teaching is good teaching, and Orff can complement Kodaly-inspired teaching very well! 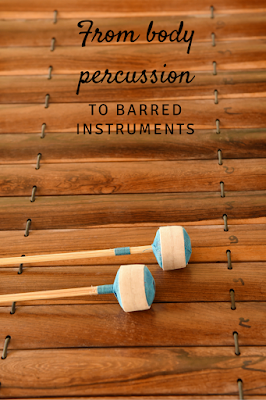 So I thought I'd write how I used this book to practice tim-ka, explore body percussion, and begin to learn a piece on instruments. Two disclaimers: first, because this is a copyrighted resource, I cannot include any music from the book. Secondly, because I am Kodaly-trained, I might have a different process than an Orff-trained teacher, so if you are Orff-trained and have anything to add, please comment below...I'd love to hear your thoughts! The book has tons of usable material--from songs with Orff arrangements, to body percussion pieces, to instrumental pieces, and much more! I paged through the book and found an instrumental piece with tim-ka that I thought I could use (it's #34 in the book.) I should note that the process I'm writing about can be used with any piece--not just #34! Now, I'll be honest, sometimes when looking at this book I get a bit overwhelmed, because I know it would take LOTS of work to perform the piece as written with my kids, and even after lots of work it might not happen successfully. So I've learned to take what I can use and simplify as I need to. So in #34, I took three measures that could stand alone as a usable motive. The first measure I used had tim-ka on the fourth beat which I thought was different and interesting. I thought it would be great to learn the melody for these three measures on barred instruments, but thought maybe I should start with it as a reading activity. So after learning tim-ka, I put the three measures on the board and had them read the rhythm. The melody starts on E, then goes to G, and also uses C and D. So I changed all of the E's to patting my lap, all the G's to snapping, all of the C's to stomping, and all of the D's to patting knees. Before I put all that on the board, I performed for the students and had them figure out what I started with (patting lap), what happened after that (snapping), etc. Once they started to figure out what happened where, I put "P" underneath the rhythms that were patting laps, "S" for snap, "K" for knees, and "C" for clapping. Then I had students take a few minutes to practice on their own. This is where I was surprised. I thought students might enjoy this, but no, they LOVED it. Students were excitedly and intently doing the body percussion piece on their own; excited whispers of "I got it!" resounded throughout the room. I realized at this point I need to do more body percussion! 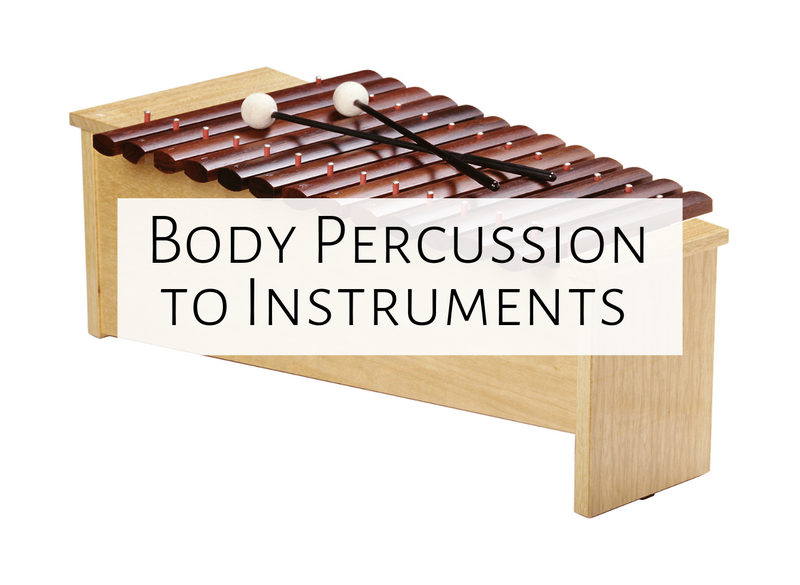 Kodaly believed that students need to start making music with their voices because it is their own instrument, but our bodies are also our own instrument, so it follows that we should do lots on our bodies too! That process above was maybe 10 minutes of one lesson. In another lesson I brought it back, reviewed it, and polished it. I also had volunteers come up and try the body percussion on their own as a solo or small group, which they really enjoyed! After a few minutes of independent practice, I had students play the last measure (the easiest), then play the second and third measures, then play all three measures. It wasn't perfect, but it was WAY better than if I had just done the instrumental part without doing body percussion first! They had internalized the rhythm and could play it so much better on the instruments because of that! Another thing I loved about this is that after having a discussion about what melody is (a discussion inspired by the book "Making Thinking Visible") I put the rhythm on the board, and asked them if there was a melody up there; they discuss that it's just the rhythm. Then I added the melody with note letters, and they figure out that NOW there is a melody. It's a great way to distinguish between rhythm and melody, as first they learned it as a body percussion piece, and then they learn it as a melody. Our next steps with the process is to polish the melody, and add one or two ostinati. I'm thinking we could also have each class figure out their own arrangement of the piece, alternating between body percussion, melody, ostinato, etc.! I hope that all makes sense and that you can use it with whichever piece you'd like! Have anything to add? Feel free to comment below! I love this process! I often use body percussion as a hook at the beginning of my lessons because it is always an engaging challenge- especially with my "too cool for school" fifth graders. Thank you for breaking it down step by step. I will definitely try this with my next melodic ostinato! Hi, do they figure out the rhythm too, or do you teach it by rote?